Beijing (AP) — China has no desire to overturn the existing international order and its increasingly powerful military does not constitute a threat to others, the spokesman for the country’s ceremonial legislature said Sunday. However, in a break with recent practice, Zhang Yesui refused to provide a figure for the rate of growth in the national defense budget. That move follows complaints that China isn’t open enough about how it funds its military or what the goals of its massive campaign of expansion and modernization are. 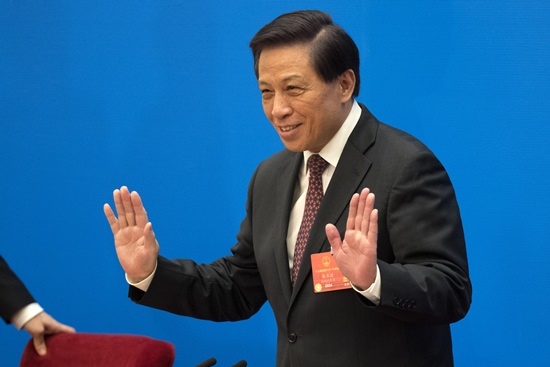 Zhang sought to strike a reassuring tone in remarks at a news conference on the eve of the opening of the National People’s Congress’ annual two-week session. He said China defended and contributed to the current United Nations-centered global order, but also said some reforms were necessary. “China’s development is conducive to world peace, stability and prosperity,” Zhang said, pointing especially to global economic growth, trade and poverty reduction. China’s secretive military had begun to open up a crack in recent years, and the National People’s Congress spokesman in recent years has made a tradition of responding to a question on the defense budget by announcing the percentage increase over the past years, at least in rough terms. Zhang, however, did not address the question of numbers, saying instead that past increases by a “modest margin” had gone to equipment upgrades, training and improving welfare and living conditions for troops. China’s defense spending as a share of GDP and the budget also remains lower than that of other major nations, he said. “China proceeds from a defense policy that is defensive in nature. China’s development will not pose a threat to other countries,” Zhang said. The finance ministry last year said the defense budget would top 1 trillion yuan ($145 billion) for the first time, after the exact figure was initially kept out of public documents released at the start of the annual legislative sessions. That marked about a 7 percent increase, continuing a trend of lowered growth amid a slowing economy, despite regional tensions over the South China Sea and other issues. Years of double-digit percentage growth have given China the world’s second-largest defense budget after the United States, which is in a class of its own with a proposed budget of $716 billion for next year. However, China’s publicly announced defense spending has never been entirely accurate since it fails to omit a significant amount of “off book” expenditures on defense equipment projects, said Peter Jennings, executive director of the nonpartisan Australian Strategic Policy Institute think tank. “What’s alarming is not the non-reporting of largely fictitious defense spending figures so much as the Chinese leadership is shedding even the pretense of being open about its military plans,” Jennings said in an email to The Associated Press. Combined with President Xi Jinping’s plans to eliminate term limits on his rule and his consolidation of control over the military, the lack of public information about defense spending and military planning “pushes China toward a more authoritarian and militarized leadership,” Jennings said. “These trends should be deeply concerning to the Asia-Pacific region and beyond,” he said.